We’d love your help. Let us know what’s wrong with this preview of Sisters of the Revolution by Ann VanderMeer. To ask other readers questions about Sisters of the Revolution, please sign up. Clearly I need to do more reading. This is a pretty solid collection. The authors I were already familiar with did not disappoint, and I came across some new-to-me authors that I want to check out in more detail now (Kit Reed & Hiromi Goto to name just a couple), and reminders to read the ones I've heard of but have not read previously (James Tiptree, Jr. & Catherynne M. Valente to name a couple again). What was lovely about this collection is that it is not entirely Anglo. There are writers from several different countries here, and while their agendas may be similar, their stories are not which made for an exciting read throughout. With any collection or anthology, there are some stories that are better than others, and this is no different. But I appreciated that each of these women were given a voice in a genre (or classification of a genre, if you want to be specific) that do not always get as much attention and that other cultures were represented here. Some of these stories were written in the 70s, such as Joanna Russ's "When It Changed". For those of us who recently read The Female Man, "When It Changed" will be familiar because Russ wrote again about Whileaway, the utopian society in which men died out from a plague (specific only to menfolk) some 800 years ago. "When It Changed" was written about three years before The Female Man, so I think Whileaway was a society Russ felt strongly about. Other stories were more recent, and those are a lot of the authors I had not been familiar with yet, but again I look forward to searching many of them out now. I love the idea behind this anthology: sci-fi/fantasy stories, written by women from many different places and times, coming together to form a multi-faceted view of feminism. It was an exciting combination of authors: old favorites, some I'd been meaning to check out, and several I'd never heard of before. There were some compelling and thought-provoking stories in here, but overall... I found it a bit tedious. Part of the reason is that, despite the variety of settings and styles, there's a de I love the idea behind this anthology: sci-fi/fantasy stories, written by women from many different places and times, coming together to form a multi-faceted view of feminism. It was an exciting combination of authors: old favorites, some I'd been meaning to check out, and several I'd never heard of before. There were some compelling and thought-provoking stories in here, but overall... I found it a bit tedious. Part of the reason is that, despite the variety of settings and styles, there's a dearth of themes. I felt that I was reading the same story over and over again: the patriarchy abusing and oppressing women, with grim consequences. While I realize that this theme is an important part of feminist fiction, reading so many similar stories back-to-back lessens the impact of each one. I would have loved to see a few stories focused on, say, female friendship, or *gasp* men and women treating each other with respect. The overall presentation and editing of the book is mixed. I liked the author mini-biographies that prefaced each story, but really disliked the one-sentence take-home messages that were tacked on to the end. I would think that any reader inclined to pick up this book would be capable of identifying such themes and messages for themselves, without having to be told that "the moral of the story is..."
The Mothers of Shark Island, by Kit Reed. If I were to recommend just one story from this book, it would be this one. It's about how we treat and think about our mothers. It's heartbreaking and universal, written in a graceful and eerie style reminiscent of The Handmaid's Tale. The Grammarian's Five Daughters, by Eleanor Arnason. A smart, funny fairy tale about how language shapes the world, and how even the most maligned parts of language have importance and power. Being in the style of a fairytale, the characters weren't especially well-developed, but the story is more than delightful enough to make up for that. The Screwfly Solution, by James Tiptree, Jr (aka Alice Bradley Sheldon). I have always held that if you want inspiration for a truly mind-bending dystopian society, look no further than the lives of the plants and animals in your own back yard. This story looks at how humans interact with "unwanted" parts of the natural world... and then takes those interactions to the logical next level. My Flannel Knickers, by Leonora Carrington. I'm not usually one to complain about lack of plot, or about world-building that leaves open questions... but this was a bit of an extreme example. And Salome Dances, by Kelley Eskridge. This story is basically about how the narrator comes to realize that trans people exist. Not exactly "speculative fiction". Sur, by Ursula K. Le Guin. Le Guin is one of my favorite authors, yet the editors somehow found a boring story by her. My disappointment is immense. Splendida antologia di penne al femminile ma devo (devo!) fare subito un appunto che ritengo fondamentale: ancora una volta mi riferisco alla traduzione del titolo. Il bellissimo – e azzeccatissimo!! !- titolo originale: ”Sisters of the Revolution sotto il quale i curatori Ann & Jeff VanderMeer hanno radunato questi racconti è tradotto con un aggettivo fumoso e fuorviante. Se anche le traduttrici in postfazione riferiscano di scrittrici molto diverse tra loro ma accumunate dall’appartenere all’ Splendida antologia di penne al femminile ma devo (devo!) fare subito un appunto che ritengo fondamentale: ancora una volta mi riferisco alla traduzione del titolo. Se anche le traduttrici in postfazione riferiscano di scrittrici molto diverse tra loro ma accumunate dall’appartenere all’ampia categoria della speculative fiction dunque “visionarie” si riferisce ad una dimensione che sta tanto nel fantastico quanto nella declinazione ucronico o distopica del fantascientifico. Personalmente, però, trovo che sia un aggettivo che in italiano rimandi al ragionamento di un folle. Il visionario non è forse colui che vive fuori dal reale, in uno stato allucinato? Perché la declinazione al femminile dovrebbe essere differente? Chiudo la parentesi perché comunque giudico importante questa antologia che sì parla della questione di genere trasferendola (con diverse sfumature) in altre dimensioni ma non perdendo di vista tematiche fondamentali e concrete. I racconti sono ventinove con scritture e modalità narrative, ovviamente, molto differenti. Una tra le più ampie è quella della prigione che può essere interpretata in senso concreto o metaforico. Ne “Le madri di Shark Island” c’è un carcere particolare: è su un’isola inaccessibile e lì vengono rinchiuse le madri quando non servono più. Poi la consapevolezza che ” Il peccato imperdonabile credo sia diventare vecchie.”. La maternità è comunque un tema ricorrente nella sua duplice azione di aggiungere e sottrarre. Perché una donna diventando madre si arricchisce ma la sua nuova definizione di identità toglie e rimuove la libertà di essere stesse. Altro tema ricorrente è quello del corpo. Ne “Le zie” si scatena l’elemento fantastico di corpi femminili nutriti dalle carni delle loro compagne più anziane per dilatarsi fino ai limiti massimi. Surreale e metaforico nel suo definire i rapporti generazionali. Nella grande varietà di stili, tra questi 29 racconti, ci sono anche fiabe come “Le cinque figlie della grammatologa” (Eleanor Arnson) che segue le tradizione della favole dove il re dona qualcosa ad ognuno dei figli che lascia il reame. In una chiave più moderna abbiamo invece il tema del femminicidio ed una rivisitazione della favola di Barbablu (una delle favole che mi terrorizzava di più da bambina!) ne “Il trucco della bottiglia” (Nalo Hopkinson). Angela Carter che però – ad oggi- non trovo nelle mie corde e, invece, Octavia Butler (una delle rare autrici afroamericane che hanno scritto fantascienza) che ho apprezzato ne “La parabola del seminatore”. Dunque un’ottima antologia con un bel team di traduttrici italiane molto valide e un’ottima occasione per conoscere altre autrici interessanti. First of all, I would like to award myself a medal for FINALLY making it through one of the anthologies on my VanderMeer shelf. It is one of the slimmer collections but I have been saying I will do this for several years! It took one of my reading groups declaring February the month of revolution, and I decided this was as good of a time as any to work through these stories. There is a wide range of stories here, wide in theme and in time period, some old enough to give tastes of "old school" spe First of all, I would like to award myself a medal for FINALLY making it through one of the anthologies on my VanderMeer shelf. It is one of the slimmer collections but I have been saying I will do this for several years! It took one of my reading groups declaring February the month of revolution, and I decided this was as good of a time as any to work through these stories. There is a wide range of stories here, wide in theme and in time period, some old enough to give tastes of "old school" speculative fiction and some much more contemporary feeling. Some were already old friends like the Tiptree, and some were complete discoveries of both author and story. I appreciate that the VanderMeers do not always pick the top 20 female authors' top 20 stories of speculative fiction, and that instead there is a wide range of expected and surprise. I also definitely noticed the threads joining the stories together, and how naturally they flowed from one to the next. "The Screwfly Solution" By James Tiptree Jr. I enjoyed reading a story by Leonora Carrington even if it didn't rank in my favorites, because I have another short story collection of hers that I'm looking forward to reading later this year. Other favorite authors that I was happy to read more of, even if those stories were also not my favorites, include Octavia Butler, Angela Carter, Nalo Hopkinson, and Ursula K. LeGuin. Dünyanın farklı yerlerinde, farklı yıllarda, farklı kadınlarca kaleme alınmış tam 28 öykü. O yıllara, o topraklara ve bir de bugüne dönüp baktığımızda görüyoruz ki bir halt becerememişiz. Hala ayrımcıyız, hala kadın olmanın erkekten aşağı kalmak demek olmadığını anlatmak zorundayız. Kitaptaki bazı öyküler kah distopik, kah güldürücü. Her türden hikaye mevcut bu antolojide. Ama dış bakış yaptığımızda, tüm o eğlenceli havasına rağmen, insanlar olarak hiçbir konuda gelişemediğimizi görüyoruz. İnsanl Dünyanın farklı yerlerinde, farklı yıllarda, farklı kadınlarca kaleme alınmış tam 28 öykü. O yıllara, o topraklara ve bir de bugüne dönüp baktığımızda görüyoruz ki bir halt becerememişiz. Hala ayrımcıyız, hala kadın olmanın erkekten aşağı kalmak demek olmadığını anlatmak zorundayız. Un gioiello imperdibile che, a dispetto della mole, ho divorato in pochi giorni. La veste grafica è già di per sé un piccolo capolavoro. La doppia copertina, la scelta dei colori e del font la dicono lunga sulla scelta di qualità di questa antologia tutta al femminile. Non un scelta di genere ma soprattutto un contributo a una realtà letteraria in costante divenire. Le autrici che compaiono in questa antologia sono scrittrici che hanno contribuito a dare vita a uno spazio creativo che ha invogliat Un gioiello imperdibile che, a dispetto della mole, ho divorato in pochi giorni. Non un scelta di genere ma soprattutto un contributo a una realtà letteraria in costante divenire. Le autrici che compaiono in questa antologia sono scrittrici che hanno contribuito a dare vita a uno spazio creativo che ha invogliato molte scrittrici ad occuparsi di sci fi ma non solo. Perché in questo volume che consta di 29 racconti, sono contenuti diversi generi, dal distopico all'horror, dal racconto tribale al fantasy. Come in un coro gospel, le voci delle autrici dialogano fra loro dando vita ad un concerto vivace e coinvolgente. Dalla Le Guin alla Carter, dalla Carrington alla Gorodischer, il lettore può abbracciare tematiche, stili e trame le più diverse ma perfettamente armonizzate fra loro. Due racconti mi hanno rimandato a due recenti romanzi: Exit west e La vegetariana. E sebbene io non sia ferrata in materia di distopia, sono rimasta folgorata da Le Madri di Shark Island. Forse perché il tema mi tocca molto da vicino e per la prima volta ho letto di maternità non come lamentatio fine a se stessa. Credo che un lavoro di questo genere, oggi in Italia, sia non solo fondamentale ma utile per schiodarci un po' dalla narrativa consueta su cui ci siamo un po' tutti adagiati. Sperimentare voci nuove, leggere storie diverse può smuovere un poco le acque dell'editoria nazionale, che a parte il lavoro di qualche casa editrice indipendente, tende verso una certa omogeneità vendibile e sicura. Questa antologia è forse un azzardo ma merita. Merita molto. È un viaggio variegato, a tratti destabilizzante, ma che consiglio di affrontare. This is a really excellent and diverse collection of sci-fi and fantasy stories with a feminist slant. A lot of the stories (as might be expected) are dystopian, but not all. There is a good mix of well known and lesser known authors, and there are many stories in translation too. As with any anthology, I enjoyed some stories a lot more than others, but the overall quality was very high and I would recommend this anthology to anyone who enjoys speculative fiction. Speculative *legal* fiction about a woman, seemingly ordinary, but the power of whose words are so intense the Constitution has been amended to stop her. What if a werewolf fell in love with a human? How would that actually work? A classic that I should have known already; powerful. A horrifying new disease, human-created, and the issues of stigma and treatment -- which sounds maybe dull, but is incredibly not so. A fairy tale to make an English professor smile. A lot. In addition to these writers, there's Ursula LeGuin, Angela Carter, Nalo Hopkinson, Nnedi Okorafor, Carol Emshwiller, Eileen Gunn, Karin Tidbeck and many others. If you're interested in speculative fiction from a feminist view point, this is a must-have. ¿No se pueden poner más de 5 estrellas? No es que todos los relatos me hayan gustado igual, pero absolutamente todos merecen estar en la antología, se nota que están elegidos con mimo. Aunque predominan las norteamericanas, hay bastante variedad en cuanto al origen de las autoras, lo cual también es de agradecer, ya que se presentan puntos de vista más diversos. Desde la maternidad o la lactancia hasta la vuelta al hogar o la guerra, los temas son muy diversos, pero todos se centran en contar his ¿No se pueden poner más de 5 estrellas? Desde la maternidad o la lactancia hasta la vuelta al hogar o la guerra, los temas son muy diversos, pero todos se centran en contar historias de mujeres, historias emocionantes y, en muchos casos, distintas de lo que estamos acostumbradas a leer. Hay relatos que me han hecho llorar y otros que me han sacado una sonrisa, ninguno me ha dejado indiferente. He conocido muchas autoras nuevas y leído a algunas conocidas y no puedo recomendar este libro lo suficiente. Espero que alguna editorial se anime a traducirlo para que llegue a más gente. “Northern Chess” by Tanith Lee. “Tales From the Breast” by Hiromi Goto. “The Palm Tree Bandit” by Nnedi Okorafor. Sadly overall, the impression I am left with is that I simply do not like anthologies all that much. Some standout stories. Some ok stories and some very weak ones. Still, I am more convinced than ever that I just have to get my behind in gear and finally read Octavia Butler. A good collection of science fiction and fantasy short stories from a wide range of authors. I enjoyed a number of the stories, all of which had a feminist slant. Some stories were scary commentaries on gender relations, while one in particular gave me a few chuckles (the one about the grammarian). I liked the editors' picks. This book is something of a challenge for me. I picked it up because it has the word “feminist” on the cover, and is an anthology (something that I find significantly easier to read during the school year because I can review in parts.) I would like to make it clear that I will not understand some of the works included in this anthology, and I hope you will not judge me for this. I will rate each piece on my enjoyment of it, but in this book more than any other, my opinions might be very wrong. This book is something of a challenge for me. I picked it up because it has the word “feminist” on the cover, and is an anthology (something that I find significantly easier to read during the school year because I can review in parts.) I would like to make it clear that I will not understand some of the works included in this anthology, and I hope you will not judge me for this. I will rate each piece on my enjoyment of it, but in this book more than any other, my opinions might be very wrong. I do not intend to offend by my words, but regard this book as a learning experience for me, and one I will try my best to take advantage of. Some of the pieces in this collection were really important and well done and spectacular and I will remember them for a long time. In some other pieces, I was significantly less pleased and there were a good amount right in the middle. Overall, I’m very glad that I read this collection and recommend it to anyone interested in getting into the genre. I feel like this work really went over my head. I mean, I liked it, but I felt like there was a lot right there beneath the surface that I truly wasn’t picking up on. That being said, the premise is incredible (I am just overcome with the desire to know what Margaret A. said; I cannot fully express how much I just want to know) and the writing is wonderful and totally fits the mood of the piece. The quality of the censorship, in even denying her a last name (a quality I find particularly interesting given the author’s decision to represent her first name as just an initial, just as Margaret A.’s last name becomes just an initial…) is a) terrifying but also b) so incredibly intriguing. I must know more about this government and this woman and she is such a sad, enigmatic person. This story left me wanting more, but also kind of embarrassed that I don’t feel like I read it like I should’ve. So I just literally have no idea what happened (basically a theme for this book, if you were wondering.) I mean, it’s definitely very pretty, but I felt the whole time feeling like I was playing catch up towards something I would never truly understand. For me, this wasn’t that great (despite the really kind of wonderful start?) Also, I loved how it came full circle and even I, playing some intense catch up, could begin to make some connections and glimpses. So I really liked this one. Of course, I didn’t understand a lot and was kind of out of it at times, but also I really liked it. Now, though I haven’t ever been a mother, I’m a little sad about the nature of motherhood in this piece (which is basically just like a thankless terrible job.) Still, it’s very gripping and, even, pretty at times. First story I could actually understand the majority of! Sweet and cute and all that, but didn’t really resonate with me or contribute to my understanding of this collection. Enjoyed it, but nothing all that special for me. Really loved this one! I mean, a) it’s about grammar and the power of words and b) it’s told like a fairytale and I just adore fairytales. In some ways (like the selling of words) it reminds me a lot of Dos Palabras by Isabel Allende. Any story that appreciates story and words has great value in my book. I’m marginally conflicted about this one. Like, I definitely didn’t dislike it by any means, but also it really didn’t stand out to me at all. I found it remarkable only in that it mentions the theater and I really like the theater and it provides a little bit of insight into the casting process etc. but I didn’t love it. I don’t remember this one even after reading through it… Interesting mentions of the murders and stuff, but overall didn’t particularly stick with me or anything. Terrifying and I love it. First of all, I tend to just really like retellings of Bluebeard because I think that they offer these really interesting insights into relationships (especially ones that can very easily escalate into abusive relationships.) Every little detail added by the author was really interesting and special: the race aspect, his anger over things like the air conditioning, and the glass bottle… all of it was truly exceptional. This story… is so incredible. Gripping and remarkable and terrifying and… One of my favorites, if not my very favorite, of the entire anthology. The fear and the idea of this disease that just… takes over a person and how Alan tried to desperately to fight against it… I loved the letters and how the entire world was really freaking out about this thing… it felt realer than some of others (despite being dated.) It really created a world in an admirable way for such a short little story. It also truly packed a punch. And, kind of like “The Glass Bottle Trick” I loved the titular element of the Screwfly Solution. Amazing. Love. Beautifully written and well put together with powerful images and wonderful ideas. Also, this story was grounded in history and reality in a different way from many others from this collection and I appreciated that layer. Huge huge fan. This is another story that I really liked and have remembered (which, to some degree, is kind of how I know which of these I really liked. If I’ve forgotten it, it probably didn’t have that huge of an impact on me.) The relationship between the narrator and her boyfriend is really intriguing and complex, the whole premise is SOOOO intriguing to me and I kind of want to check out all of the books that Ms. Butler mentioned at the very end of the story. Loved it. Just not it for me. Skimmed it and kind of forgot what was happening while I was reading. I hope that this is not what everyone’s experience breast feeding is like, but I did really enjoy this and found it to be incredibly poignant. Gorgeously written and illuminating some interesting relationship dynamics… painful and well put together. Very good! Interesting and cool with a little bit of pain kind of sprinkled on top. Not sure I entirely agree with or understand the overall message of the story, but still enjoyed the reading experience! Super super interesting take on the idea of splitting up the binary genders and then reintroducing the two together. l liked the family aspect of this story but the rest of it wasn’t as powerful for me. Also, I do kind of get a little uncomfortable with the idea of men as a pure and unadulterated evil… I don’t know. These “women as _______” didn’t really work for me, unfortunately. A little bit too much meaning for me to really latch on and appreciate what they had to offer. I’m sure that they’re amazing for some, just not for me! This was beautiful and devastating. The controlling nature of the relationship and just basically every element of the story kind of broke my heart but I still adored it. How she was tamed… just limited in every single way and not allowed any agency in her own life. I loved this. I think this is my actual favorite. Spectacular. Fine, interesting world, but overall didn’t really strike me in any particular ways. Super cool idea, well executed, unique in this anthology of very unique stories, and at least the general idea has remained with me and is at the top of my head when I sat down to write this. So, this is to say, that I liked it and it worked well but wasn’t necessarily the best, in my opinion. I very much liked the very end of this story and the “moral” or kind of ending message type thing, but the rest of it really wasn’t my cup of tea (I mean, it was fine, but just really didn’t stick out to me and I kind of rushed my way through because I just wanted it to be over.) That being said, I was very pleasantly surprised by the ending. Definitely not as enamored with this one as I really wanted to be (as I know that Ms. Le Guin is definitely one of the most influential writers of the genre.) I liked the relationships between them all, but like… the adventure type and like wilderness… I don’t know, it just really wasn’t for me. Kind of difficult to read, but still a good story, in my opinion. Again, very interesting premise, though. REALLY liked this story about people projecting their desires onto others (especially women, in this case) and not letting those people have their own identities apart from how others construct them. Anyway, I really appreciated a lot about this story, even when it was kind of heartbreaking and difficult to read. I mean, to be fair, I didn’t understand a lot of the science-y parts… they just kind of went over my head so I basically skimmed those parts. I liked the idea of putting together these creation myths with science stuff, but really the part which was most impactful for me were the parts where she wrote about the “science fiction writer” which was a lot more like what I was looking for. I didn’t… get anything out this, really. Like, I’m looking back at it now, and obviously it was the last one that I read so it should be fresh in my mind… but I’m not really remembering lots. Average, not bad, but not exceptional or one of the ones from this that will really stick with me for a while. 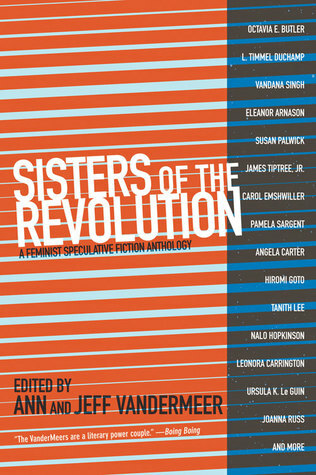 Sisters of the Revolution, edited by Ann and Jeff Vandermeer, is a reprint anthology that brings together work from some of the most important feminist voices in science fiction. This is not hyperbole. Among the works collected in this PM Press publication are Joanna Russ’s When It Changed, James Tiptree Jr’s The Screwfly Solution, Octavia Butler’s The Evening and the Morning and the Night, and Ursula Le Guin’s Sur, as well as several other stories I’ve read and loved before from authors Eleanor Arnason, Vandana Singh, Nalo Hopkinson and Elisabeth Vonarburg. There were also a fair number of stories new to me, by authors both familiar and new. It’s an outstanding collection of writing by remarkable women. As such, it is both deeply enjoyable in its right, and an encouragement to seek out further examples of the feminist vision in speculative fiction. The style of the first two stories really got in the way of the interesting premises, and I started the third one but have kind of lost interest. The writing just makes it too difficult to get carried away with the stories. There's a nice trend on Kickstarter and other crowdfunding sites, of crowdfunding anthologies based around specific themes that might not find a home in traditional publishing. This book is a good example. I participated in its Kickstarter, and I'm proud that my money helped this book find a home in the world. It's a very professional effort, as would be expected from the editing team of Jeff and Ann VanderMeer. Unfortunately, all the stories are from years past and cannot be considered for this There's a nice trend on Kickstarter and other crowdfunding sites, of crowdfunding anthologies based around specific themes that might not find a home in traditional publishing. This book is a good example. I participated in its Kickstarter, and I'm proud that my money helped this book find a home in the world. It's a very professional effort, as would be expected from the editing team of Jeff and Ann VanderMeer. Unfortunately, all the stories are from years past and cannot be considered for this year's awards, although the anthology itself could be nominated for, say, the Locus Awards. It would make a worthy nominee, as far as I'm concerned. "The Forbidden Words of Margaret A.," L. Timmell Duchamp--Margaret A. is so feared by the US government that the Constitution is amended to silence her, and she is held in a one-person concentration camp with no contact with the outside world, save for a monthly visit from a journalist. We never find out exactly what she says, and that's not the point. (It is mentioned, though, that Margaret A. is a black woman, which is rather telling, even more so now than when the story was written.) The story is not really about Margaret A., but rather the journalist who speaks with her, and who discovers she cannot live with the status quo any longer. "The Grammarian's Five Daughters," Eleanor Arnason--a delightful, beautifully written fantasy about the power of words (quite literally the parts of speech: nouns, verbs, adjectives, adverbs and prepositions) and the women who wield them. "The Screwfly Solution," James Tiptree, Jr (aka Alice Sheldon)--a classic of the genre, just as disturbing now as it was nearly forty years ago. "The Evening and the Morning and the Night," Octavia E. Butler--I've read a lot of Butler's stuff, but somehow I missed this story. It's tremendous. "Tales from the Breast," Hiromi Goto--the premise of this story sounds absurd, but man, the ending bites. "Northern Chess," Tanith Lee--a lush fantasy story that hinges on a similar reveal to Eowyn's "I am no man!" from The Return of the King. But my favorite of the bunch, as dark and depressing as it is, is Susan Palwick's "Gestella," which asks a simple question: what happens when a female werewolf, with canine aging patterns, falls in love with a human? For modern sensibilities, the beginning is a bit squicky, but the story is a powerful treatise on how women are often used and discarded as they age. And the ending is just...oh my God. A woman's ideas are so radical and powerful, the government makes it illegal for her to speak. A woman learns to see her husband in a new light after she accidentally breaks the bottles he keeps to contain the spirits of his dead wives. Young people born with a devastating disease that causes delusions they are trapped in their own skin try to make their way in a world that fears them and misunderstands their illness. A horror story about breast feeding you really shouldn't read if that's something you ever plan to do, but that might provide some relief if you have breast fed and felt unsupported in the endeavor and its difficulties. Lord, this story haunts me. A space colony is cut off from Earth, and after the men die off the women adapt and thrive in a mono-gendered society for hundreds of years until one day Earthling men return. This vies with the Tiptree for my favorite story in the collection. Reminds me of Ammonite by Nicola Griffith, though the publication of this story preceded that novel by 30 years. A female werewolf tries to make her relationship with a human professor work as she ages at seven times his rate. Another haunting story. Remixing the world's creation myths with origin stories, scientific and personal. Valente's stunning talent on display here. Really solid collection. My perennial favorite Le Guin is present in a story I hadn't read before, as well as James Tiptree/Alice Sheldon's The Screwfly Solution, one of her most feverish and finest stories, and Catherynne Valente who I have lately enjoyed. The others were all new to me, but of particular interest were Carol Emshwiller, Pamela Sargent, L. Timmel DuChamp, Leena Krohn, Pat Murphy, Eleanor Arnason and Octavia Butler. Loved the stories of Arnason, Emshwiller and Octavia Butler's The Really solid collection. My perennial favorite Le Guin is present in a story I hadn't read before, as well as James Tiptree/Alice Sheldon's The Screwfly Solution, one of her most feverish and finest stories, and Catherynne Valente who I have lately enjoyed. The others were all new to me, but of particular interest were Carol Emshwiller, Pamela Sargent, L. Timmel DuChamp, Leena Krohn, Pat Murphy, Eleanor Arnason and Octavia Butler. uneven. opens with some pretty leaden, plodding parables, then moves onto some really interesting older stories i had missed (why haven't i read james tiptree before? because my library has no tiptree books, that's why.) and then i stopped reading. you know how authors use bad things happening to animals to prove points about human characters? i react badly to that and the most extreme example of it i have ever seen is in the middle of this anthology. not only could i not finish the story, i coul uneven. opens with some pretty leaden, plodding parables, then moves onto some really interesting older stories i had missed (why haven't i read james tiptree before? because my library has no tiptree books, that's why.) and then i stopped reading. This anthology, everyone. A beautiful, multi-faceted collection showing the many shades and shapes that feminism can take; addressing a variety of issues; and showing how the female voice and identity in SFF were forged. A great introduction to those interested in this aspect of genre lit, and a powerful read that will stay with you for long after. So many amazing voices, and so many of them I haven't read before. An exemplary anthology. There is not a single weak or even mediocre story here and many of the works included rank among the finest tales in the canon. This is an absolutely essential read for anyone who loves speculative fiction. kitaptaki öyküler kesinlikle kötü değildi ama çok büyük bir kısmında çok temel 2 eksik vardı: ruh ve derinlik. okuduktan bir gün sonra bir önceki öykünün ne anlattığını hatırlamak için ilk sayfalarına bakmam gerekti. aradan sıyrılan birkaç öykü tabii ki var ve çok da sevdim o öyküleri ama 28 öykülük bir derlemede olmasalar tuhaf olurdu zaten. ayrıca türkçede angela carter'ın öyküsü yok. orijinalinde 29 öykü var antolojinin. While a few of the stories were well-written and compelling, a number of the stories relied on ham-fisted, forced imagery and overdone tropes of the genre to illustrate tired, vague messages about patriarchal existence. However, it did introduce me to some new speculative authors, so for that I'll give it 3 stars instead of 2. The broad banner of speculative fiction is, bar none, my favorite. I love it all -- fantay, sci fi, horror, everything in between. This is a speculative anthology, the unifying theme being all works by women, and truly covered all bases (in the broadest sense -- I mean thirty stories still can't cover the myriad of sub genres but there were so many flavors represented here). I don't even know how to begin shouting my love of this anthology. So many utterly unique and diverse stories gathered toge The broad banner of speculative fiction is, bar none, my favorite. I love it all -- fantay, sci fi, horror, everything in between. This is a speculative anthology, the unifying theme being all works by women, and truly covered all bases (in the broadest sense -- I mean thirty stories still can't cover the myriad of sub genres but there were so many flavors represented here). I don't even know how to begin shouting my love of this anthology. So many utterly unique and diverse stories gathered together in one spot -- more than one story I finished with my mouth hanging open, bowled over by something unlike anything I've ever read before. I started keeping a list of my favorite selections but soon realized that was a fool's game as my particular favorites far outweighed the ones I didn't connect to as much. And, a truly rare thing in anthologies, there were barely any I was indifferent about or outright disliked. Actually I think there were zero I completely disliked, just one story that went over my head. Une anthologie de textes de science-fiction féministe qui reflète une variété de sujets (du gynocide à la violence faite aux femmes en passant par le racisme, les préjugés, l'écologie, etc.) et d'auteures. Aucun texte ne m'a laissé sur ma faim et, bien que je connaissais la majorité des auteures du recueil, je n'ai pas pu m'empêcher de noter de nouvelles lectures à effectuer suite à ma lecture de l'anthologie. À la fois une excellente introduction à la SFF féministe, mais aussi à la SF en général Une anthologie de textes de science-fiction féministe qui reflète une variété de sujets (du gynocide à la violence faite aux femmes en passant par le racisme, les préjugés, l'écologie, etc.) et d'auteures. Aucun texte ne m'a laissé sur ma faim et, bien que je connaissais la majorité des auteures du recueil, je n'ai pas pu m'empêcher de noter de nouvelles lectures à effectuer suite à ma lecture de l'anthologie. À la fois une excellente introduction à la SFF féministe, mais aussi à la SF en général et aux thèmes abordés par les femmes dans ces genres littéraires.